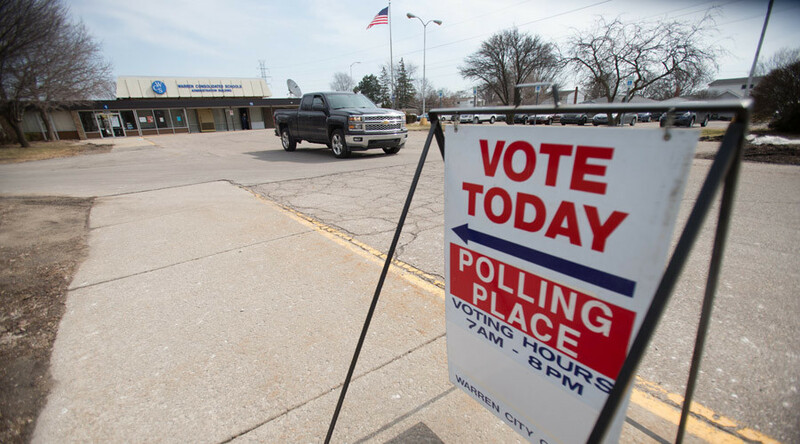 As voters in Michigan hit the polls to cast their ballots in the Democratic and Republican presidential primaries, for many it was local issues such as the Flint water crisis and the fate of Detroit that carried the most weight, not party horse races. Michigan is also the largest state to be holding a primary on March 8, with 59 Republican delegates and 148 Democratic delegates to be claimed by candidates. So while Donald Trump looked to solidify himself as the GOP frontrunner and Hillary Clinton looked to stave off Bernie Sanders, numerous voters in the Greater Detroit area expressed disappointment with all candidates – and the lingering concern that their communities weren’t going to get another chance at prosperity. “I’m a faceless part of the system,” said Detroit resident James Harris, now working at Central United Methodist downtown. He said it’s the only job he can get due to the felonies on his record. Fortunately, Harris said “the church saw something in me that I did not see in myself.” He added that he voted for “whatever’s against Donald Trump,” but that no one – Republican or Democrat – was speaking about what to do for people who had lost their homes to foreclosure, or for those who were swept up in the criminal justice system. In 2010, Detroit became one of the US cities that stopped asking job hunters to report a felony on their record early on in the hiring process, but many voters say they haven’t felt the impact of the change. Resident Erica Porter echoed Harris’ concerns, saying that neither Clinton nor Sanders had sufficiently outlined a plan to explain how they would help former felons transition back into the community. She explained that she knows a kid who “was caught up young” and cannot get a job because of the stain on his record. As a result, she was torn about who to vote for. As Porter looked out at a school playground that was just filled with children playing, she said the crisis in Flint and the state of Detroit Public Schools were not just local issues, but that they were about providing opportunities as well as second chances. “We have to make sure we’re not losing all of our young black men to the judicial system,” she said. One issue that loomed over the entire primary was the situation in Flint, where residents with lead service pipes to their homes received contaminated water for about a year and a half after the city tapped the Flint River for its drinking supply. 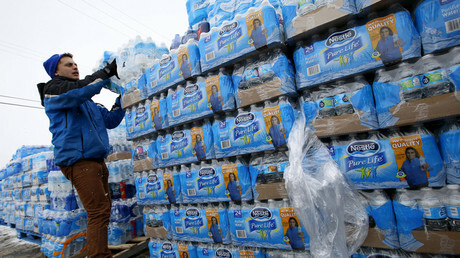 Back in October, Michigan officials acknowledged that the water was poisoned with lead, but anger has continued to build ever since. During primary day, many voters pointed the finger squarely at Republican Governor Rick Snyder, who appointed the emergency managers in charge of Flint when the water switch occurred. Snyder has insisted he didn’t know about the poisoning until late last year. Mark said that after Flint, she is concerned that the water in Southfield is contaminated as well, to the point that she no longer drinks tap water at all. “Snyder is an accountant… that doesn’t mean take money out at the expense of people’s lives,” added Muhammed Hussain of West Bloomfield. Another voter, Noah Walker, said that Clinton and Sanders have also erred on the Flint crisis. “Not calling for [Snyder’s] arrest is a dereliction of duty,” he argued after voting. He said candidates need to be against the emergency manager laws implemented in Michigan, which gave power over cities and entities to state-appointed managers. “It’s human democracy versus the absolute death of cities, stripping them of democracy,” he said. Detroit is not exactly a conservative hotbed, so it’s unsurprising that many residents had negative things to say about GOP frontrunner. Those who did cast their vote for the real estate mogul, though, all expressed admiration for the way he has fought the Republican Party power brokers. “Nobody had the courage to talk about the open borders and Americans dying because of illegal immigrants. It doesn’t make you a xenophobe because you want borders on your country,” he added. Connie Kincer of Livonia, a former ladies’ chaplain for the Veterans of Foreign Wars, also said that she was in favor of some of Trump’s proposals. She argued that he was the strongest candidate on veterans’ issues. “I wouldn't have a clue” about what Republicans want to do, Detroiter Bruce Hunt said after voting in the Democratic primary. He said that immigration will affect the entire United States, and that the world is watching to see what America will do. “Politicians are being against the person,” he said, referring to Trump’s proposals to bar Muslims and Latinos from entering the country. “They are not looking at a policy. It’s scary” to be singling people out, he said. With polls showing Sanders cutting into Clinton’s lead in Michigan, voters said they were choosing between idealism and experience in the Democratic race. “The feasibility of Bernie’s plan is close to zero. Bernie will have the effect of a lame-duck president on day one,” he added. Martin argued that while there will also be opposition to Clinton, there is more room for bipartisan consensus on issues such as minimum wage increases and equal pay for women. Tayshia Williams, a college student, also expressed some concerns with Sanders. She said that while she loved the idea of free college tuition, she didn’t want to see taxes go up. Back in Detroit, some voters weren’t completely sold on Clinton, either. Noah Walker said he was “very skeptical” towards Hillary and her “very inconsistent” claims that she supports African-Americans. He argued that the Bill Clinton-era crime bill she supported it essentially paved the way for controversial stop-and-frisk policies in the US. Whether residents cast their ballots for Clinton, Sanders, or Trump, one thing was clear.